The annual National Day takes place on Thursday 24th August, and to mark the occasion The Dinner Ladies are holding a special Burger Duel supper club at Brother Marcus cafe in Balham, where the ladies, the Marcus team, and 2 other chefs will all serve up their burgers (or similar - e.g a Bao) for you to try, and find a winner from. A supper club based on burgers? Sounds good to me! Tickets are just £33 from Grub Club. "A meat-lovers creative collaboration between FOUR street food chefs battling it out to be the best tasting burger. Try four creative burgers from different parts of the globe at this indulgent feast, along with sides, regional craft beers and good music. 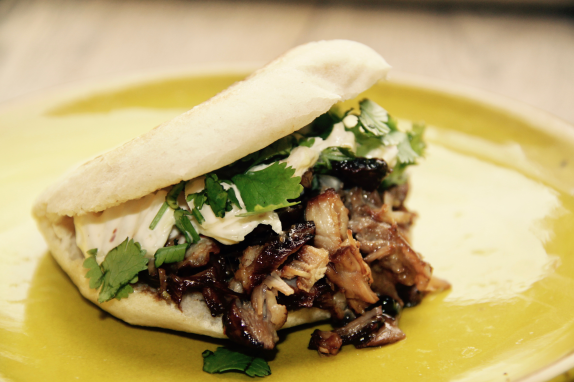 Chinese Han Bao Bao by Dinner Ladies - Glazed pork belly slow cooked in Sichuan spices, Chinese cabbage slaw & coriander in chewy Mo Bao. Cretan Burger by Brother Marcus - Tumeric and buttermilk chicken, kasundi & crunchy greens. Brother Marcus is an innovative Balham cafe introducing high quality supper clubs to the area. A one-off special mini burger festival in the heart of Balham."